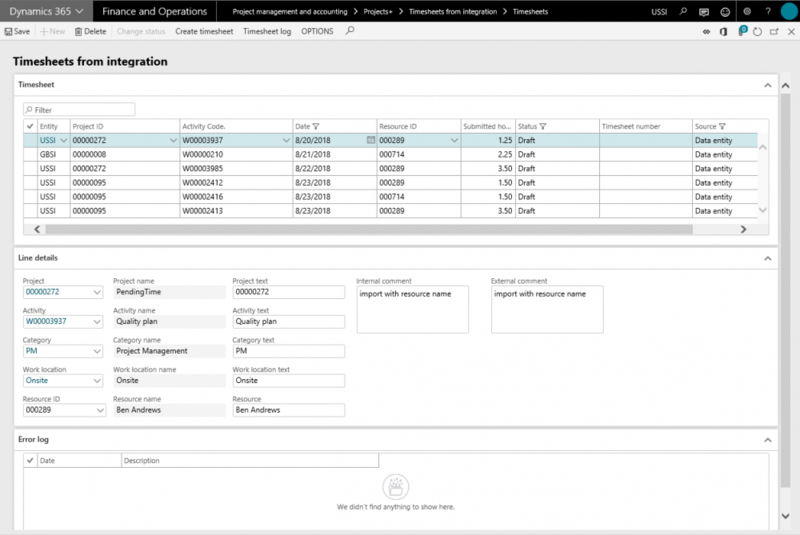 *This section shows how you can review the imported timesheet lines and take actions on the lines in the error or draft status in the Microsoft Dynamics 365 for Finance and Operations. Shows all the imported records in this grid. Most of the fields on this grid are editable, except the timesheet number and source. Timesheet number field is updated on successful transfer of line to the timesheet. Source field updated to ‘Data entity’ for all records on this form coming from either excel import or through the PSA integrations. Data on this grid filtered with status as not ‘Processed’ and source as ‘Data entity’ by default. This section of the form shows the data related to the line selected on timesheet grid. All text fields i.e. Project text, Activity text, Category text, work location text and resource are editable, but we advise not editing them as these fields are the reference of what was imported. Even if the imported values do not resolve to correct value, user can make the right selection by looking at these fields. Selecting the right fields, will not replace values in text fields. This section of the grid shows the errors related to the line selected on timesheet grid. If the selected line has multiple issues, those lines of error will be displayed against that line in this grid. Save Allows you to save the changes to the records. Delete Allows you to delete the selected records. Change Status Once you rectified the errors on the lines, use this button to change the line status from ‘Error’ to ‘Draft’. You can use button on the multiple selection as well, but make you are selected only the error records. Create timesheet Use this button to transfer the selected records to timesheet. User can select multiple records at a time transfer them to timesheet. Timsheet log Opens a timesheet log window, where users can the errors releated to the selected line. If user has tried to transfer the lines multiple times and ended up with errors every-time, that history can be seen in this window.